Retail is experiencing problems. Those problems relative to auto sales and restaurant activity which have been covered by the main stream media. 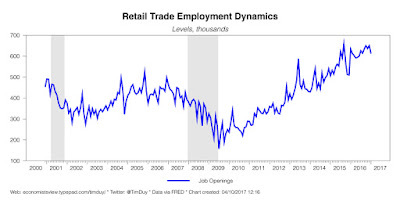 Make no mistake, these sections of retail are leading indicators of problems ahead. They need to be watched carefully and they could cause fear and risk off in stocks. So, layoffs have not started. But that doesn't mean that retail is not slowing. It is. And for the auto industry, the sales force is making fewer commissions. That is like a partial layoff. Waiters and waitresses make money through tips. If there are fewer customers and fewer tips, those act as a partial layoff as well. It is time to tell it like it is. Self driving cars are practically useless. They are dangerously useless too. I have looked at the top ten major reasons they are useless and the case to be made is strong. I personally believe self driving cars are a scam, and we will see that they are so useless that you have to consider the scam angle when deciding where to put your money. The government should consider that as well. It is difficult to see how driverless cars are any more than a money grab and a con of immense magnitude. The immensity of the scam is obvious when we see hundreds upon hundreds of articles supporting self driving cars. Self driving cars are a totalitarian concept. Totalitarian minds will do everything in their power to impose self driving cars on the populace. It is how they think, and it is similar to making cash obsolete. The totalitarian nature of both is easy to spot. Totalitarianism is not progress. The stock market does not fear nuclear war. It fears a Fed not responsive to its every need, but does not care about nuclear war. There are two solid reasons for this. And we have a scenario in which this brinkmanship played out, the 1962 Cuban Missile Crisis. Lars Christensen coined the phrase "Market Monetarist" and claims to be one. He wrote an interesting article about the Cuban crisis. I remember the crisis. I was 13 years old. It left a mark on me and on most who lived during that time, because no one knew that the Russians and Americas would back off from nuclear destruction. The blockade of Cuba seemed to portend the imminent destruction of the world.